Before the hospital released me, with our newborn twins, the nurses spoke with my husband and I about Postpartum Depression after twins (PPD). I remember thinking why they would even mention this to me. We tried for so long, and went through so much, to have these babies. Why would I ever be depressed? Within a week, I had gone through many emotions. Let alone being exhausted, uncomfortable, and getting into a new routine with our daughters being home. Working out was an outlet of mine. Four days after delivering the girls, I went on a walk/run. It was challenging, especially pushing a tandem stroller for twins that was not equipped for jogging. Yet, I felt like it was a small victory for me but that feeling quickly faded. This was a pivotal moment for me, as I immediately felt like I lost all sense of myself. I felt like my family all knew that they could take better care of the girls than I could. 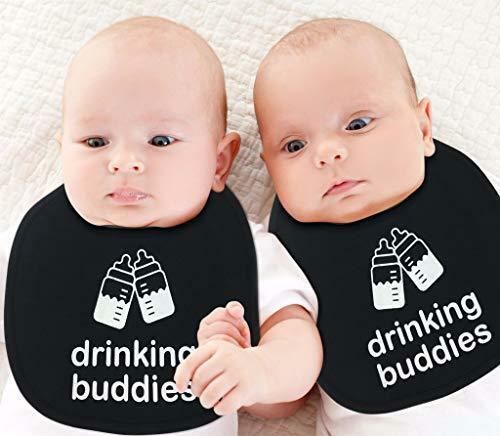 Everyone seemed to be quick at getting their bottles ready, changing their diapers, and bathing them. A sloth had more pep than I did. It just broke my heart, and I would retreat into an empty room and cry. My doctor talked to me about PPD, at a follow-up appointment. I explained to him that, growing up, there was a family member who told me that anything to do with depression/anxiety was made up and I just needed to be happy all of the time. Regardless of how I honestly felt. Tears streamed down my face, as he told me that being depressed/ anxious is a chemical imbalance. Especially after having multiples, because the hormone levels drop tremendously quick. With such a sudden decrease, it can take a mom of multiples longer to get back to where she was prior to the delivery. As soon as I came home, I explained this all to my family. My husband, mom, and grandma all knew that I was going through more than we all expected. When I opened up to them, it turned out that my mom and grandma all went through this too. Unfortunately, my mom was unable to talk about it because of the environment that we lived in when I was growing up. My mom had shut that portion down, believing that those feelings were truly made up. She told me that there were times where she felt overwhelmed and would cry at random. She had her parents to talk to, but was afraid, in case the other family member found out. My grandma felt bad because she recalled how she felt, which was the same way as my mom, and I did. Back in the 1950’s, it was not socially acceptable to discuss such feelings. She just chalked it up to being a new stay at home mom and wife. 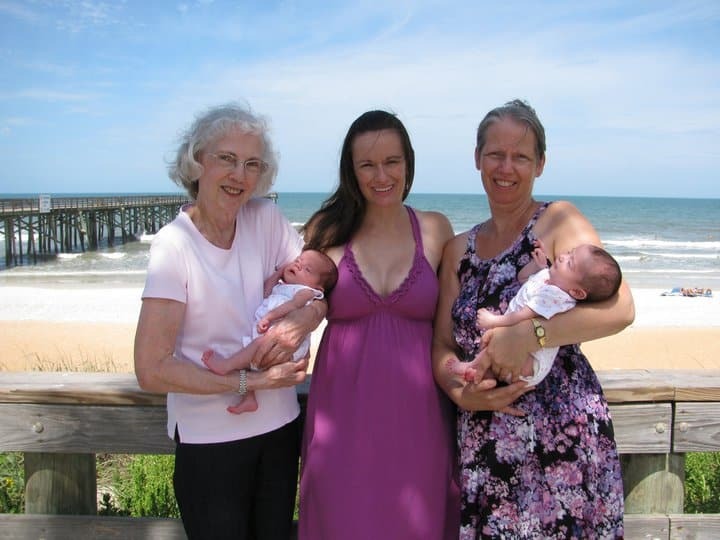 Four generations: My grandmom, mom, me, and the twins. My doctor gave me a prescription for an anti-depressant, and a therapist on standby if I needed one. Over time, I began to feel better and was weaned off the medication. I had my understanding husband, mom, and grandma around me to get through those challenging days. The more that I talk about PPD, depression, and anxiety; the more that I find out how common it is. As I have grown older, I am more of an open book, and not afraid to share my experiences. If someone gives me an odd look, after talking to them, so be it. Perhaps they, too, are going through a similar experience and are not ready to accept it. Or, they do not understand because (thankfully) they did not have any of those trials. Keep in mind, not everyone goes through PPD. This is something that you must discuss with your doctor. Do not be afraid to talk to other female family members. Speak with your partner and keep everyone that is close to you in on how you are feeling. You may not see, or feel, some of the changes taking place. Those around you will be able to, though. There is nothing wrong with that. It’s a good thing because it means that they love you! The support that you have around you, especially after delivering your twin babies, is there to help and not to hinder. Accept their offers to watch the babies for you while you sleep, run some errands, take a shower, or whatever that you want to do for yourself. Take some time to focus in on yourself. If you do not take care of yourself, how can you care for others?